Airsoft Softwair - the hardest working men in code business - are proud to present a brand new add-on for Hollywood 6.0: The Hollywood APK Compiler. This program does what many people were waiting for: It allows the conversion of Hollywood applets into stand-alone APK packages that can then be published on the Google Play Store or distributed in an other way. Once the Hollywood APK Compiler has been set up, the conversion of a Hollywood applet into an APK file takes only a few seconds. Additionally, the Hollywood APK Compiler can also install the generated APK file onto an Android device connected via USB. The Hollywood APK Compiler is currently only available for the Microsoft Windows platform because it requires the Java SE Development Kit (JDK), Apache Ant and the Android SDK and NDK toolchains, all of which are available for free download on the web. Versions for Linux and Mac OS X might follow in the future but Amiga versions are impossible because of those dependencies. Hollywood 6.0 is also required. 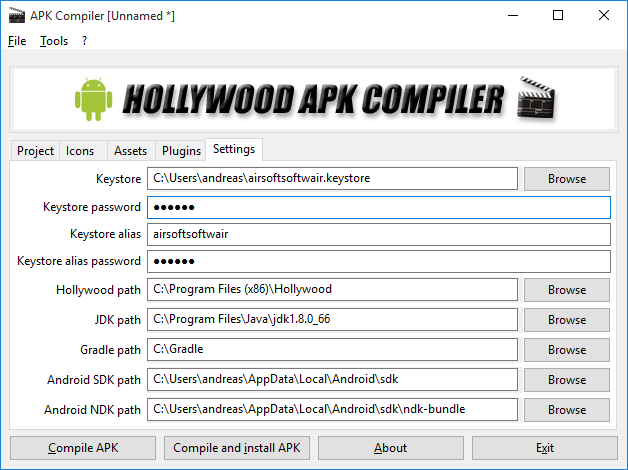 The Hollywood APK Compiler comes with a convenient GUI that allows you to convert your Hollywood applets into stand-alone APK files with just a few mouse clicks. A detailed documentation of all the program's features is also included. The APKs generated by the Hollywood APK Compiler will run on all ARM-based Android devices that run at least Android 2.3.3 (Gingerbread). The program's license also allows you to sell the apps created by the Hollywood APK Compiler without any restrictions or royalties. So there is nothing stopping you from getting rich quickly with your Hollywood applets on the Google Play Store now! Programming and publishing for Android has really never been so easy! 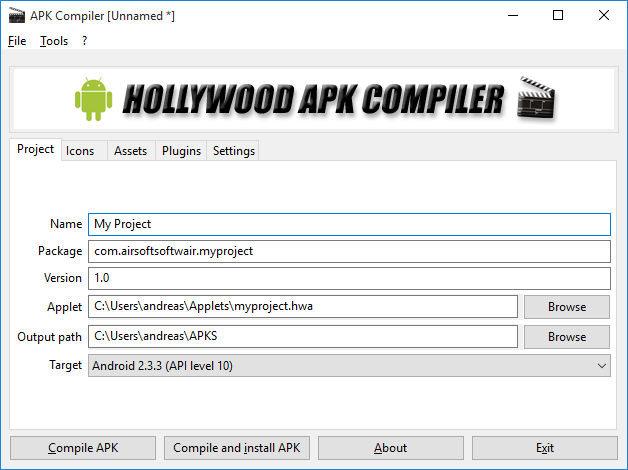 So get ready for Android development and purchase the Hollywood APK Compiler now on the official Hollywood portal! This release was brought to you by Airsoft Softwair - the hardest working men in code business. So my idea of an Online-APK-Compiler didn't worked? Andreas this is an awesome news! I've no words to express my gratidute, your efforts to give us a complete cross-platform development environment is... just... incredible! Thanks Andreas for this program to Hollywood! Because Android SDK and Java SE Development Kit already I had downloaded. I dropped the remote server compile idea because of security concerns. Remember that every Android app needs to be signed with a personal keystore. This keystore file is something very confidential but when compiling APKs online it would have to be uploaded to the server in order for the server to compile an APK. This entails all kinds of security considerations which I just would like to avoid. I don't even know if it would be legally allowed to upload the keystore file to a remote server. The local compile solution with the Hollywood APK Compiler is really a much cleaner solution and you don't have to give away any of your private files like your keystore. This is really so much better than an online solution because you're completely independent. Of course, it's a little bit sad that now it's impossible to compile APKs from an Amiga but there are really major security concerns with a server-based solution because of the keystores which would have to be uploaded to the compiler server. Would it be possible to write an APK compiler app for Android? So one could convert a Hollywood applet to an APK on his smartphone? I don't think that this is possible since you need the entire JDK, SDK, NDK toolchain and it's not available for Android. A cross-compiler for Windows is really the most natural solution. Maybe a Linux version will follow for people who don't like Windows but everything else doesn't really make sense to me. Thank you so much for getting this compiler done. It sounds and looks even better than I expected (and I have high expectations when it comes to your work). Can't wait to try it out! This is cool. Offers quite some opprtunities. Will it get x86 support too? There are quite some Atom based Android devices popping up recently.